Four Seasons Bistro Dinner Drop Off (10-25) For Amelia Island Lunch or catering Call: Stephanie's Sugar & Spice 904 277 9779 Inside there is seating for service and a deli counter filled with fresh salads and pastries. Locals may recognize Stephanie from Four Seasons Bistro, which she owns and continues to operate with her husband Michael. Pesto Chicken Club is a show stopper, or her homemade soups. This was the perfect warm weather beach food, refreshing and delicious. Stephanie's Sugar and Spice also makes a lovely place for coffee and homemade scones. It is open Monday 11-6, Tuesday through Saturday at 9-6. You will also love working with Stephanie for all of your catering needs, from weddings to corporate luncheons and family reunions. Located at 503 Center Street. Stop in and see what’s cooking. Four Seasons Bistro is a local family owned Bistro that has been open for Four Years and counting. We are a unique bistro that offers a comfortable, casual atmosphere, and best of all fresh fare, from our “Homemade sauces” to our "Give them something to talk about" Steak Marsala special. Our kitchen is an integral part of our dining experience. Four Seasons prides itself on consistency, of food with lots of flavor, and the best staff in Fernandina! Tuesday through Sunday, 5:00 pm to 6:00pm. No Substitutions. Not valid with any other offer. Chef prepared veal Marcella on my request – it was good. My wife’s spaghetti and meatballs were excellent as were the salads. One of the best values in dining near Amelia Island. Many thanks for a great evening meal. Excellent and the ambiance is comfortable and noise level quiet so we could converse. Very enjoyable evening. Food was great. Worth a visit! Great warm bread to start, very nice server, very good food. so glad to see other diners are coming to this wonderful place to enjoy their great food and ambiance. hope to see you in the Fall. Went for Sunday brunch, many great choices. Krissy our server is great! 40 mins to get our drinks and order taken. There was a tie up due to another check. I would think the manager would have handled that so a server is free. Food was not hot. Never asked if I wanted a we second drink. Wrong name on reservation and had corrected it twice. I see it is still wrong. I had really been looking forward to dining for the first time with my friends. We will give you another chance. This was our second visit and we loved it as much as the first time we visited. Our waiter was so good, the food excellent and we had a lovely table for two in the back! Fantastic!!! Outside of billing a billing error at our table, the evening was perfect. We’ll be back soon which says it all! Italian food is recommended more than Greek choices. Casual dining with very good value food. The staff was helpful and pleasant. Our waitress was very friendly and accommodating. If I knew her name I’d mention it.. hasn’t been there that long she told us but she is definitely an asset with the prettiest auburn hair. Great food and service. The ambiance was lacking. Another great meal. Keep up the good work!! The shrimp dishes were excellent, the chicken parm was mediocre, the house salad (we had peach dressing which was very good) and the ceasar salad were delicious. Our server was very nice and attentive. We’d go here again but skip the Italian dishes and go with the seafood/fish. Food was excellent and Michelle provided great service. Will visit again soon. able to have a conversation. Service was great, very friendly and helpful with food selection. Have been going there quite a lot lately ... neighborhood gem, sorta thing ... always has been, and was again last night, great!!! Wife had the Greek Grouper orzo, I had the Shrimp & Grits with Grouper (a different take on that dish), and both were excellent. Have had different waitpersons each time we've gone, but all have been outstanding. Would highly recommend!!! Thx and congrats to owners Mike and Stephanie!!! Great food, varied menu and wonderful service. Always great place to dine. Can't wait to go back again. Absolutely would recommend Four Seasons Bistro - the food is delicious. You know you're going to get a consistently good meal at Four Seasons Bistro. The service is fabulous - treat us like family. Arrived 15 minutes ahead of reservation, was seated quickly, host was quiet and reserved it seemed. waited 15 minutes before our server even arrived to take our drink order, to keep from just continually rant about the service i would rate it poor at best. I have wanted to try this place for a while was not impressed. Orders were taken from other patrons that arrived after us and were served prior to us. I work in a service industry and if I treated my customers the way I felt like we were being treated I would not be in business. was celebrating a birthday with a very special friend, and I would say this took away from the special part of it . I hope you make improvements to your wait staff . Wish we had found this restaurant earlier in our vacation week - best meal by far on the island! Delicious quinoa with potatoes and vegetables, awesome shrimp appetizer, husband and son enjoyed chicken Marsala and spaghetti and meatballs. Great meal! I was staying in Kingsland, GA and wanted to find a special restaurant to celebrate my birthday. I made reservations and was delighted in my selection. The seafood lasagna was amazing and I took home half of it because I couldn't finish it! We ended the evening with white chocolate, raspberry cheesecake and it was delicious. When I made the reservation, I mentioned my birthday. To my delight, there was a birthday balloon tied to pole outside of the restaurant and at my chair. I would highly recommend Four Seasons Bistro for any occasion. This was our first visit and overall it was very good. Our server was excellent, food good and very reasonably priced. We will definitely go back but hope there is a quieter and more considerate clientele when we do. 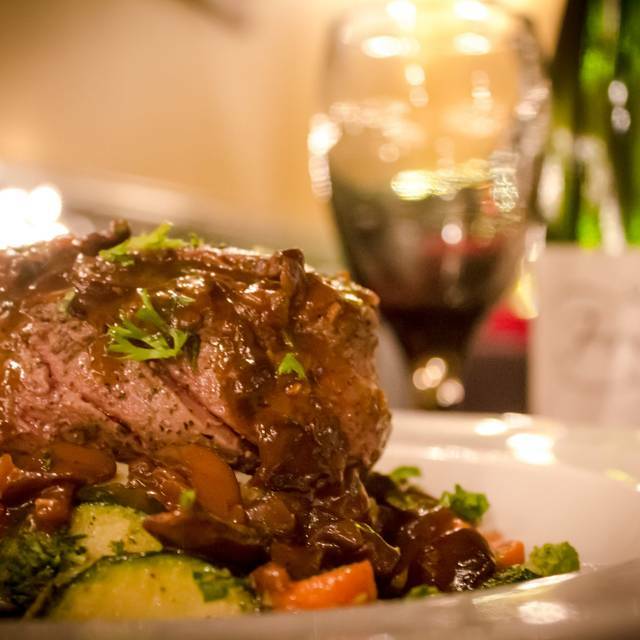 Four Seasons Bistro is on our list of favorite restaurants in Fernandina Beach! We make a point to dine here every time we are in town. Was looking for somewhere to have dinner while in town over the Amelia Island Concours weekend. Of course, everything was booked for dinner and looked on Yelp to find anything. Found the restaurant with excellent reviews and with a single reservation available at 8:15 we went for it. We will say the reviews were spot on, the service was very good and the food was even better. 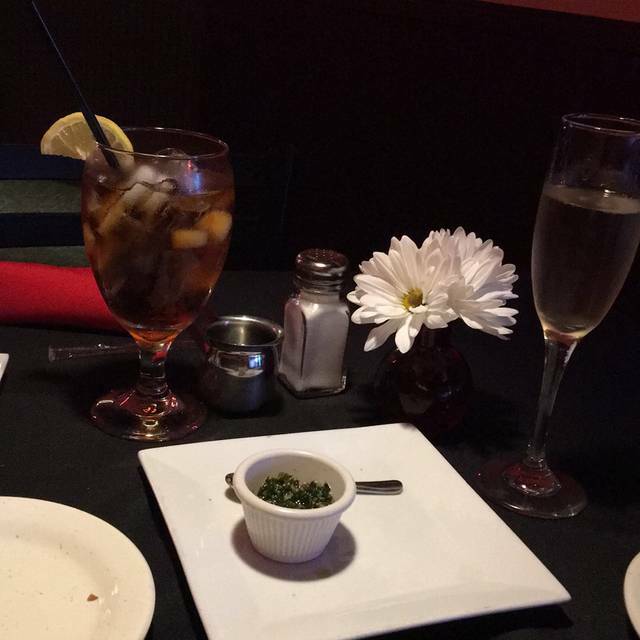 My girlfriend loved the food and service. We didn't know what to expect but we're were surprised by the staff and food. Well done! Meatballs and spaghetti was authentic and really delicious! Great find. Small quaint place. They were extremely busy due to fact it was Concurs Weekend, but handled it well. The food was great our server was good. I wish she would have checked on our drinks and such more often, but like I said it was extremely busy so I assume that it's probably caused by that. A nice casual dinning experience. We had well prepared food and would return. Great food, great value, charming atmosphere. This will not disappoint, looking for a bargain, try early bird special - second entree half price!! Could become the go - to-place. Our favorite for quality food! We visit with family as our #1 go to when in town! We have dined at Four Seasons multiple times and were eager to treat our new neighbors to dinner. Unfortunately, this was a very poor first introduction. Service was horrific from start to finish. The waitress had to ask us to repeat our orders multiple times, would note that we needed refills only to return without water, and repeat the process again. We got our dinner salads before our appetizer, and then had a lengthy break before receiving our entrees, a full hour after we were seated. Our plates had been cleared for a solid 15 minutes when the waitress reappeared to inquire about our meals...and refill our water glasses. We clearly had no food nor had we been asked about dessert, but at that point, we all decided we would decline dessert as we knew it would add who knows how long to the timeline. We finally had to go to the bar to ask for the check as she never reappeared. The owner offered to comp our check but the food was great. Hopefully they can give some much needed training to the wait staff. All told, we were there over 2 hours. Always enjoy our times at Four Seasons because the food and staff are the best. We are travelers, currently staying in Jacksonville Beach. We had preselected where to eat for our visit to Fernandino based on reviews here and elsewhere. As we drive up, we were surprised it was in a small strip mall. Upon entering, we found a nicely appointed Italian restaurant with a nice menu and wine selection. It is very clean and staff were helpful and pleasant. Bathrooms were OK. We enjoyed our starter of calamari and also entrees of lasagne and chicken fettuccine alfredo. Our food was good, not exceptional. The food and service were great! The decor could have been more up to date, but overall, a great experience. We happened in on “date night” and were pleasantly surprised by each getting a free glass of wine and a free shared dessert. Service was great and food was delicious. Great evening. My daughters birthday - the restaurant staff went out of their way to make the night so special! Thank you Michael, Mel and the entire staff - my daughter was thrilled! Fun night for all and the food was delicious! We love Four Seasons with and without a reservation we have always been seated promptly, the food is delicious and the owners and staff are always very courteous. My husband chose the special on Saturday and said it was excellent!